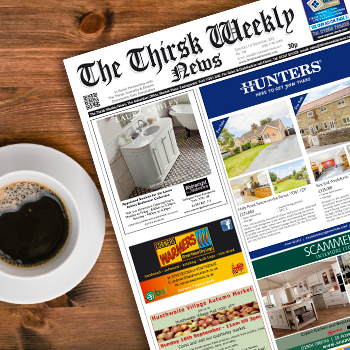 'The Thirsk Weekly News' was launched in July 2004 as a sister title to 'The Easingwold Advertiser & Weekly News'. The idea for a Thirsk newspaper came about during the course of a domestic conversation, as the current editor's wife and family worked in Thirsk. The discussions ranged around 'The Easingwold Advertiser' and how Thirsk and district could benefit from a newspaper specifically and only about this area. There are numerous publications and papers which include Thirsk but generally they have an overwhelming slant towards Northallerton, and even Teesside. If you read the following account of the origins of the Easingwold paper you will see that the Thirsk area has always been part and parcel of not just the publisher's family (4th Generation) but also closely linked with the Easingwold area; we may be separated geographically but we are all part of the same community. The first one - with the grand name of 'The Easingwold Chronicle and North Riding Advertiser' - was actually a very small affair. Its originator was the famous local printer and author, Thomas Gill. One year later, in 1855, it had proved so popular that Gill decided to produce a larger version with the new name of 'The Easingwold Times'. Not satisfied with this more modest title, he changed it to 'The Easingwold Chronicle and Thirsk Times Advertiser'. Unfortunately, though extremely talented, he was no businessman and, to help him out of his difficulties, John and Joseph Smith of Easingwold bought the newspaper in 1862, renaming it 'The Easingwold Times'. 'The Easingwold Times' was wound up, with L & G H Smith concentrating purely on print. The print works, in 1867, was called L & G H Smith, Printers. In 1870, George transferred the Post Office to the Market Place - where the HSBC Bank now stands (then the Yorkshire Bank). From this site he also sold wine, spirits and pianos. This extraordinarily enterprising man also established a printing works in the cottages behind - through the ginnell in the corner, known as the 'Post Office Slip'. The works went under the name of the Bremmer Printing Works - named after the massive gas-powered printing presses. George's son, Reginald Ernest Smith, published the first true 'Advertiser' in January 1892 under its full title of 'The Easingwold Advertiser and Weekly News'. The format has hardly changed since - the main difference being that national news is no longer featured. In 1920, Reginald's son, George Smith, took over. The present owner is his son - David Smith. During David's time at the helm we have seen the transition from letterpress and hot metal setting through to offset litho and computerised typesetting. Now we use the latest desk top publishing software. The paper has gone from traditional black and white to full colour printing. The next generation of the Smiths have taken over the running of 'The Easingwold Advertiser & Weekly News' and look forward to producing a newspaper with a traditional feel which is also fit for the 21st Century.